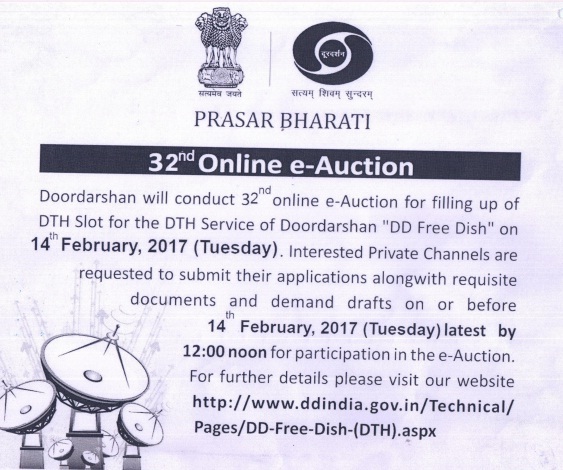 DD Free dish will going to conduct its 32nd online e-Auction for filling up of DD Free Dish DTH slot of Doordarshan on 14th February, 2017 (Tuesday). Interested Private TV channels are requested to submit their applications along with requisite documents and demand drafts on or before 14th February, 2017, latest by 12:00 noon for participation in the e-Auction. TERMS AND CODITIONS FOR 32nd ONLlNE E-AUCTION TO BE CONDUCTED ON 14TH FEBRUARY, 2017 (TUESDAY). 1. Doordarshan will conduct 32nd online e-Auction for filling up of Vacant DTH Slot for the DTH Service of Doordarshan's DD Free Dish on 14th February, 2017 (Tuesday). 2. The Reserve Price per DTH Slot is Rs.4.80 Crores. 3. M/s. C1 India Pvt. Limited, Gurgaon will conduct the 32nd online e-Auction on behalf of Prasar Bharati. All the interested channels should submit Uplinking and Downlinking permission from the Ministry of I&B along with the Application. Participation Amount is Rs.1.50 Crore (Rupees One Crore and Fifty Lakh) only, Demand Draft in favour of PB (BCI) Doordarshan Commercial Service, New Delhi. Processing Fee (Non-refundable) Rs.10,000/- (Rupees Ten Thousand) only, Demand Draft in favour of PB (BCI) Doordarshan Commercial Service, New Delhi. 5. The Demand Drafts should be issued by any Scheduled Bank. 7. Online Training will be provided to all the participants by M/s. C1 India Pvt. Limited, Gurgaon. 8. Incremental amount will be Rs.10.00 Lakhs for 32nd online e-Auction and every e-Auction will be of 15 Minutes duration. 9. Additional 5 Minutes will be added if the bid is received before the closing time of each e-Auction. 10. Next Round of e-Auction if held will be conducted after 10 Minutes after each round of e-Auction. 12. The successful Channel is required to arrange their own IRD Box in advance to place their Channel old DD Flee Dish Platform on time. 13. The EMD Drafts will be returned to the unsuccessful Bidders within a week or immediately after the e-Auction is over. 14. The Successful Channels are required to deposit Rs.1.10 Crore ( 1st Instalment) of Reserve Price within one month from the placement of Channel on DD Free Dish alongwith Service Tax @ 15% on total Bid amount. 15. The 2nd Instalment amounting to Rs.1.10 Crore to be deposited by the successful channel in the second month from the placement of Channel. 16. The Balance Bid amount should be deposited on or before Six Months from the placement of the channel on DD Free Dish failing which the deposited amount shall be forfeited and the channel will be discontinued from DD Free Dish after 21 days discontinuation notice. 17. Prasar Bharati reserve the rights to accept/reject/cancel/amend the e-Auction/slot at any time during the e-Auction or after e-Auction. 18. 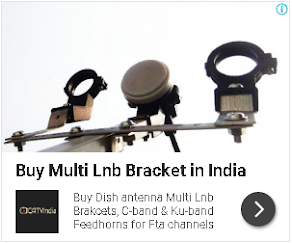 All revision, clarification, corrigenda, addenda, time extension etc., to the e-Auction will be hosted on httD://www.ddindia.gov.in/Technical/Pages/DD-Free-Dish-(DTH).aspx Bidders should regularly visit this website to keep themselves updated.